It's easy to make fun of the Invicta watch shows on latenight infomercial TV. But, those shows often feature some very nice watches. 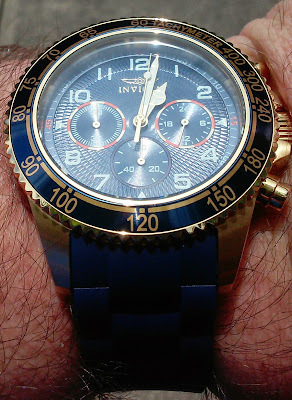 My wife recently spied this Invicta Specialty Pro Diver Chronograph watch on evine television and ordered it for me. The watch arrived very quickly. Design. This Invicta is an attractive gold and navy blue watch with a blue polyurethane strap. 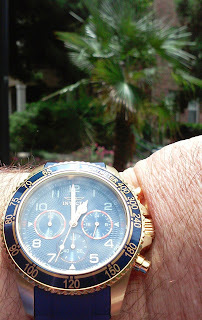 It has tachymeter markings on a non-rotating bezel. The watch has three subdials. At 3 o'clock, you'll find a 24-hour clock. A 6 o'clock subdial provides the stopwatch seconds. The 9 o'clock subdial provides up to 60 minutes of elapsed time. 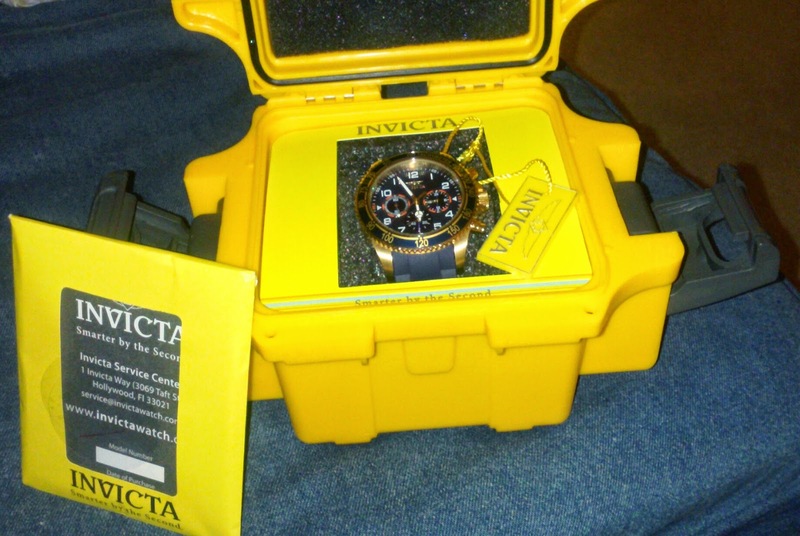 Invicta is known for providing value by giving extra unexpected touches. This watch came with a very cool bright yellow one-slot dive case. On the watch itself, the dial has a guillochè pattern that provides a background with texture. It's a touch normally found only on very expensive watches for the elite. It makes this Invicta look rich. 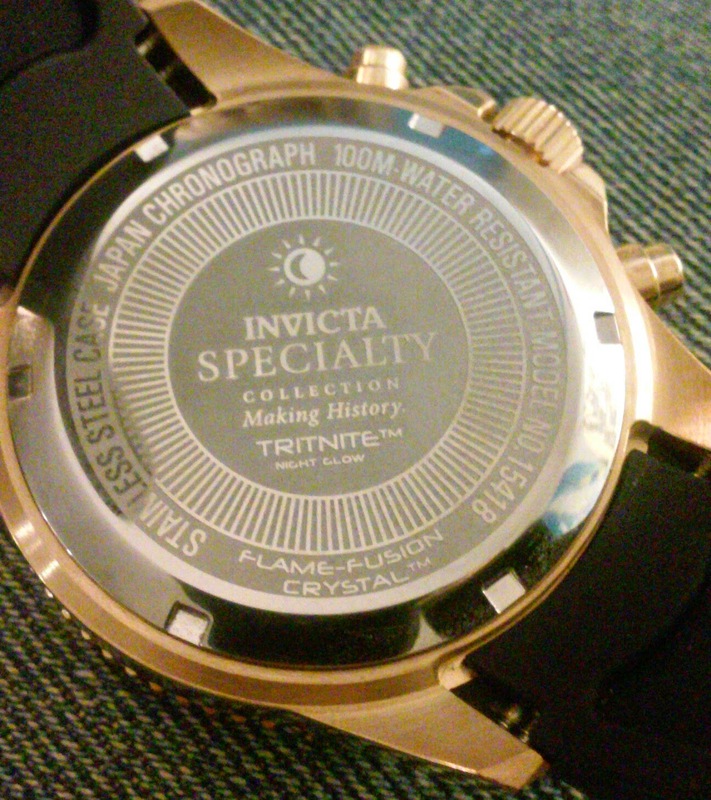 On the flip side, the caseback has a nicely etched design and provides information about the watch. The strap has the Invicta logo etched onto the buckle. Construction. This Pro Diver watch has a stainless steel case that provides 100 meters of water resistance. The back is a screw on back which should make changing the battery a little easier somewhere down the road. The strap is made of flexible polyurethane. According to the evine website, this watch has a flame fusion crystal. 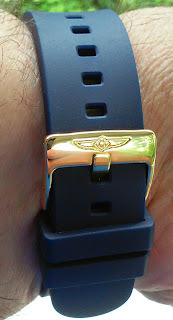 The watch has lume (which Invicta has trademarked as Tritnite) on the hour, minute, and second hands. Dimensions. This watch has a 45 millimeter diameter case that is 12 1/2 millimeters thick. The maximum wrist size is 8 3/4-inches. It's a comfortable, well-proportioned, watch that I didn't find clunky. Drawbacks. This watch is really nice. 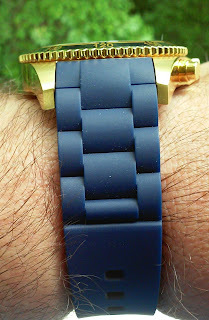 For me, the only drawback might be the longevity of the polyurethane strap. Otherwise, it provides a rich look in a comfortable watch. Overall, I really like this watch. Initially, I wasn't a big fan of watches in gold. However, this watch uses gold as an accent and looks really good. This watch looks like a million bucks, but retails for a lot less.